Royal Canin Maxi Adult is a complete dog food for large dogs weighing between 26 and 44 kilograms. Specially formulated to support the unique health needs of large dogs, this product helps to ensure your pet lives a happy, healthy life. Royal Canin Maxi Adult has been designed with the unique health concerns of large dogs in mind. Because of their size, large dogs are prone to digestive, cardiac and joint problems. The food helps to reduce the chance of developing these conditions through an enriched formula high in EPA and DHA (omega-3) fatty acids, which help to maintain circulation and digestion. Royal Canin Maxi Adult’s added taurine – an amino acid that helps the body to process fats quickly – helps to support your dog’s circulation and cardiac health, which is often put under strain in large dogs. The food also includes a high glucosamine and chondroitin content to support the joint health of your pet. Glucosamine and chondroitin are important structural components of cartilage and provide much of its resistance to compression – essential for optimum health. helps to maintain joint health with glucosamine and chondroitin enriched formula. 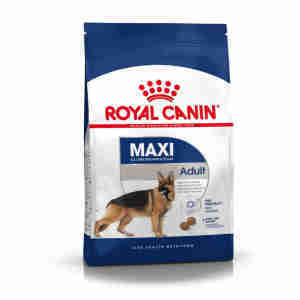 As a complete dog food, Royal Canin Maxi Adult is designed to be your dog’s regular meal. As a result of their size, large dogs are particularly susceptible to circulatory problems and weak joints, which need extra care and attention as a result. Without this, large dogs can develop painful, long-term circulatory and joint problems, including painful arthritis. Ingredients: dehydrated poultry protein, maize, maize flour, animal fats, wheat,rice, maize gluten, hydrolysed animal proteins, beet pulp, fish oil, soya oil,minerals, yeasts, hydrolysed crustaceans (source of glucosamine), hydrolysedcartilage (source of chondroitin). ADDITIVES (per kg): Nutritional additives:Vitamin A: 15500 IU, Vitamin D3: 1000 IU, E1 (Iron): 43 mg, E2 (Iodine): 4.3mg, E4 (Copper): 13 mg, E5 (Manganese): 56 mg, E6 (Zinc): 168 mg, E8(Selenium): 0.08 mg - Technological additives: Clinoptilolite of sedimentaryorigin: 5 g - Preservatives - Antioxidants. ANALYTICAL CONSTITUENTS: Protein:26% - Fat content: 17% - Crude ash: 6.6% - Crude fiber: 1.3% - Per kg: Omega3fatty acids: 7.8 g including EPA/DHA: 4 g.
Our 7 year old Airedale has eaten this product and a few shoes etc since she was weaned. She is as strong and healthy as ever. Wouldn't change it. My order arrived before suggested time Hannah our Airedale really loves her royal canin only compliant the packing could be more secure. Royal Canin is definitely the best food on the market. I have rared all my pups on it, and my adult dogs. Royal Canin is one of the best foods you can buy for your dog. My 18 mth old golden retriever had lots of tummy problems but not any more since she has been on RC. She has a beautiful coat , lovely bright eyes and full of energy. She was on the puppy one but is now on the adult. I highly recommend Royal Canin. The service from pet supermarket is first class, fast delivery, helpful customer service and any problems are soon sorted out, definitely 5 star service.